There are many issues relating to a wind turbines impact on the surrounding environment, and these contribute to the significant level of disadvantages of wind turbines. This article discusses some of the impacts wind turbines place upon the environment, and the disadvantages of producing this type of natural electricity. The most noticeable impact a wind turbine places upon the environment is noise pollution. Many people think wind turbines are a great idea, yet a large proportion of these people would oppose a wind farm development close to their home. This is down to the noise, and many people compare the sound output of a wind turbine to a small jet engine. The impact of noise pollution has the potential to lower property values within a varying radius of the construction. Modern technologies are ever increasing the efficiency of wind turbines, yet they fail to decrease the noise output by significant levels. The noise pollution can greatly depend on the average annual wind speed (i.e. 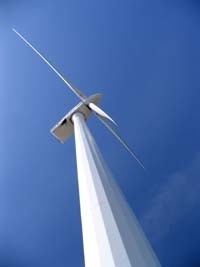 the higher the wind speed, the greater the noise output can be) and the size of the blades. Noise pollution is said to be one of the biggest disadvantages of a wind turbine. Another disadvantage regarding a wind turbine and it's impact on the surrounding environment can be expressed with the term "visual impact" or "visual pollution". Some people believe wind turbines actually look quite nice, yet many people disagree. You may enjoy the visual impact of turbines, but this does not stop the majority of people seeing turbines as a scare on the landscape. The third and final most significant impact of a wind turbine on the surrounding environment is mainly argued by wildlife groups. In some areas of wind farm developments, birds have been found dead around the base of turbines. The force of the blades high up in the air may not seem powerful to you, yet they are more than capable of harming wildlife. Also tied in with this matter is the construction of wind turbines. As with many other developments, wind turbines need deep foundations, and this has the potential to destroy underground habitats, and disturb surrounding ones. So there we have it, some of the impacts and disadvantages of the various wind turbine developments across the world.